As at today, January 11th, 2013, nine-year-old Anjolaoluwa Mautin Botoku cannot lay substantial claim to widespread fame. She has however served notice that her name is one that the world should watch out for in the future. At her very tender age, she has written a dreaded examination and did creditably. The examination is the General Certificate of Education (GCE), the private equivalent of the Secondary School Certificate Examination (SSCE) that people wishing to gain admission into the university must pass in order to be admitted. GCE and SSCE are however dreaded because many people are only able to pass them after years of trying. So when little Anjola perused some of the GCE past question papers that one of her brothers was studying and declared that she could take the GCE exam, her brothers Jide and Olujuyin were both amused and incensed at her ‘impudence’ to the extent of deciding that they would register her for the exam so that she could walk her talk. Knowing that GCE is not a piece of cake, the brothers probably knew that the only way their ‘brash,’ and therefore ‘annoying,’ little sister would eat the humble pie was if she wrote the exam and did not do well in it. So when they were registering her for it and they encountered the problem of her being ineligible for it as she was younger than the minimum age set for the exams, still wanting her to eat the humble pie made them do what they shouldn’t really have done: they increased her age by five years so that the online registration process would register her. And they succeeded. She got registered for last year’s GCE and was listed to write it at Victoria Island Secondary School, Lagos. If her brothers wanted to eat the humble pie, they succeeded somewhat when little Anjola arrived at her exam centre. Being a little girl indeed, in both age and stature, she stood out among her fellow candidates who attacked her immediately, saying, “Little girl, what are you doing here? Are you sure you are here to write the exam?” The above are even nice comments. There were some really rude ones. “Overambitious girl, you are not supposed to be here. Why don’t you wait for your time? You are very greedy,” and on and on like that. Even the examiners didn’t want to allow her into the hall but only did so because the biometric test they did proved that she was indeed the registered candidate. Mrs Abosede Botoku, her mother, says she expected that her fellow candidates would harass her. “I expected that she would be harassed so I wasn’t surprised by it,” she told Saturday Mirror. And so Anjola wrote the GCE, but she didn’t answer all the papers, she did just two, French and English. “I wrote just French and English because I had teachers who tutored me in them. My father is a former French teacher and my mother has a degree in English so they both taught me those two subjects.” When the results were released, she made C5 in French and C6 in English. Hazarding a guess as to why she didn’t do as well as she expected in English, her mother said, “I believe two things worked against her. The first is overconfidence. I feel she was overconfident and it affected her. In my own days too, I was very overconfident when I wanted to write English and I got a lower grade than I expected. 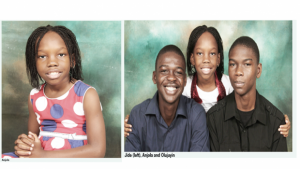 So why did little Anjola feel that she could write an exam far advanced for her age and more suitable to her fourteenyear- old brother, Olujuyin? “It’s the way our parents brought us up,” she responded. “My mother is a magistrate and my father a lawyer. They insist that we must read, and when they bring newspapers home, it’s always a struggle between me and my brothers over who would read them first.” Technology is another factor that also helped greatly in enhancing her intellect. She has ample access to the internet and she had got to read about the feats of many young people in other parts of the world and she felt she could be like them. Such young people include the youngest professor ever, Alia Sabur, who became a professor at 18 years, an undergraduate at 10, and got her first degree at 14 from New York State University.